Reverse Engineering of 3-D Crack-Like EDM Notches and Phased Array Ultrasonic Results on Low-Pressure Turbine Components Mock-Ups. 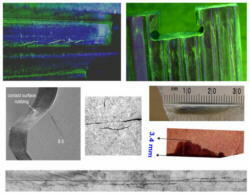 The paper presents a summary of reverse engineering of complex defects (crack-like EDM notches and other surface-breaking defects) performed on reference blocks used to validate the phased array inspection on low-pressure turbine components manufactured by Alstom/ABB and Siemens/Parsons. The scope of this program, which started in 1998 and is on going, is to assess the capability demonstration and procedure improvement for large-scale in-situ inspections. The following technical aspects are presented: reverse engineering of fatigue and stress corrosion cracks using Kubotek-Key Creator software, importing files in Imagine 3D ray tracing and ultrasonic simulation software and phased array results on 3-D crack-like EDM notches. A comparison with real UT data from service-induced cracks is also presented and discussed. Based on these results, Inspection and Maintenance Services - Ontario Power Generation incorporated this technology in feasibility studies and capability demonstration programs for low-pressure turbine components. 3-D data plotting into part and scanning animation are also presented and discussed. Different aspects of capability demonstration were presented in World NDT Conferences, European Conferences, EPRI Phased Array Seminars, and EPRI Turbine Workshops (ref. 1-15). The paper will present the technical problems linked to reverse engineering of cracks, a comparison of phased array data from cracks and crack-like EDM notches and advanced data plotting into 3-D isometric part of the mock-up with crack-like defect. 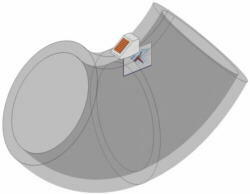 The process of reverse engineering is under continuous improvement, and will be part of validation steps of PAUT applied to turbine components. 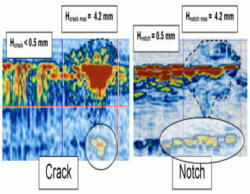 Obtain the crack morphology (length, height, location, orientation and shape) from a combination of NDT and destructive events: phased array data, magnetic particle inspection, acetate and/or rubber replica, and fracture mechanics (see Figure 1 and Figure 2). 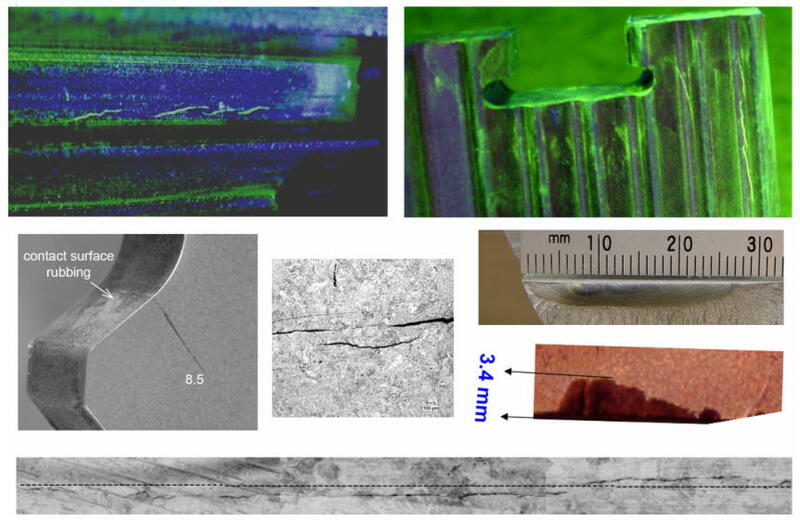 Figure 1: Example of different service-induced cracks in blade roots and steeples detected by magnetic particles, acetate replica and fracture mechanics. Figure 2: Example of crack length, height shape and orientation displayed by PAUT data and confirmed by magnetic particle inspection. 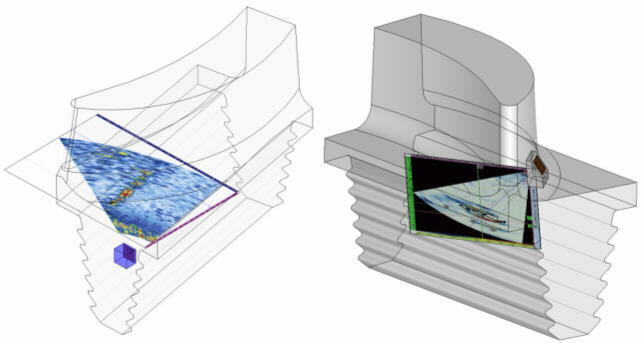 Once the crack parameters were well established, a high-resolution picture is imported into KeyCreator 4.0 design software and crack is developed into a 3-D model (see Figure 3). Figure 3: Example of crack parameters developed with KeyCreator 4.0. Top and middle: crack length and shape. Bottom: SITCO die for cutting the complex notch into L-0 blade. The crack is implanted into the part and a virtual cutting tool is created (see Figure 4). Figure 4: Example of crack implant into the convex side of the blade (left) and tool development (right). The link between the KeyCreator and the other pieces of software is presented in Figure 5. Figure 5 The link between KeyCreator and other pieces of software used by PAUT. Examples of crack-like EDM notches are presented in Figure 6 and Figure 7. 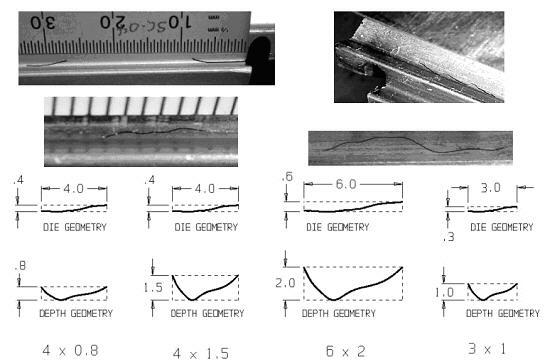 Figure 6: Example of 3-D complex EDM notches cut based on reverse engineering of cracks. 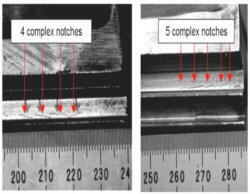 Figure 7: Example of 3-D complex EDM notches cut on row 10 inlet Siemens-Parson blades. The same set-up from the field inspection was used for detection and sizing of 3-D complex notches. 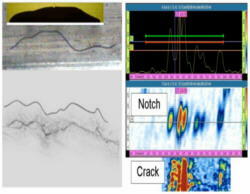 In spite of notch width (last significant tip) much larger than a crack, the UT data were similar to those from service-induced cracks (see Figure 8 to Figure 10). Figure 6: Comparison between PAUT data from a 3-D complex notch on hook 5-Alstom 900 MW turbine and the crack signature. Figure 9: Comparison between PAUT data from a 3-D complex notches on row 10 blade-Siemens 580 MW turbine and the cracks signature (side technique-diffraction). Figure 10: Data comparison between a crack (shallow+deep) with a complex notch (0.5 mm + 4.2 mm). Shallow complex notches produce strong echoes than shallow cracks, as we expected. However, the pattern is very similar, with double multiple echoes behind and a mode-converted at 7-9 mm behind the specular echo. Data plotting into 3-D specimen is very useful for technical justification, probe design, technique optimization, technician training to understand the complexity of ultrasonic set-up (probe-defect interaction) and for reporting/auditing purposes. The following examples illustrate the detection, sizing and orientation of different defects and techniques for Alstom and Siemens turbine parts (see Figure 11 to Figure 13). 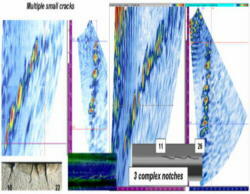 Figure 11: Examples of crack data plotting into L-0 steeple Alstom turbine of 900 MW. Figure 12: Examples of data plotting into row 10 blade ref block NDE #1 with 3 complex notches (Siemens-Parson turbine of 580 MW) for top (left) and side (right) techniques. 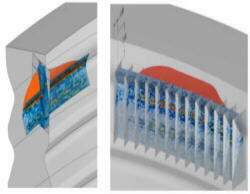 Figure 13: Examples of data plotting into inlet side of row 10 blade block NDE #3 with 4 complex notches (Siemens-Parson turbine of 580 MW) for side (left) and wing (right) techniques. Due to the complexity of procedure validation and special set-ups required for large-scale inspection on low-pressure turbine components, the reverse engineering must undergo a QA protocol. In spite the 3-D complex notches are far-away to match a service-induced crack, the PAUT pattern displayed by these reflectors are very similar to those acquired during the real crack detection and sizing. This technology is much better than validation on straight elliptical notches, namely for side techniques (diffraction). As technology is evolving, we are looking to improve the following aspects: notch roughness (from fracture mechanics), notch width (CNC laser cutting) and improve our database with service-induced cracks and UT data correlation. This will lead to avoid costly defects and the destruction of valuable retire-for-cause specimens (namely blades). The link between finite-element stress analysis and crack location occurred after 160,000 h of operation will give us a better opportunity to improve the procedures, scanner performance and increase productivity for data analysis/reporting. Data plotting into 3-D part is a very useful tool for over-all activity of phased array inspection. This tool will be improved in the future for a faster data analysis and defect-probe scanning pattern correlation. Once this 3-D technology is solved for complex parts, it will be transferred to the welds and to other components (elbows, feeders) (see Figure 14). Figure 14: Example of data plotting on a 2.5" introdous feeder for detecting a 10 x 1 mm complex notch. Lamarre A., Dubé, N., Ciorau, P.: " Feasibility study of ultrasonic inspection using phased array of ABB L-0 blade root - Part 1" - 5-th EPRI Workshop for Steam Turbine and Generators, Florida, July 1997. Ciorau, P., et.al. : "Feasibility study of ultrasonic inspection using phased array of turbine blade root and rotor steeple grooves- part 2": 1-st EPRI Phased Array Seminar - Portland, Sept. 1988. Mair, D.H., et.al. 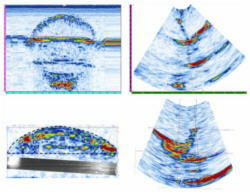 : " Ultrasonic Simulation - Imagine 3D and SIMSCAN. Tools to solve inverse problem for complex turbine components" - The 26-th QENDE Annual Review of Progress, Montreal, July 1999. Ciorau, P., et.al. : "In-situ examination of ABB L-0 blade roots and rotor steeple of low pressure steam turbine, using phased array technology. Proof of principle results" 6-th EPRI Workshop Steam Turbine / Generators - St. Louis, August 1999. Daks, W.: et.al. 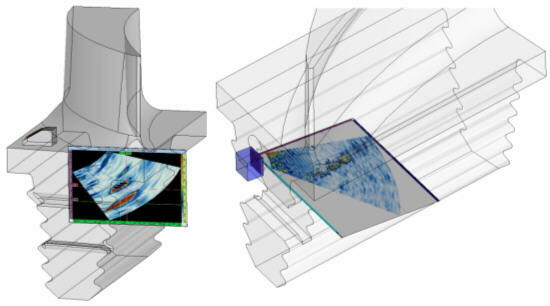 : "Advanced 3D tools used in reverse engineering and ray tracing simulation of phased array inspection of turbine components with complex geometry" - 8-th Eur. Conf. NDT, Barcelona-Spain, June 2002, paper 100. Langlois, P., Ciorau, P., Macgillivray, D.: "Technical Assessment and Field Application of Portable 16-pulser Phased Array Instrument" - 3-rd EPRI PA Seminar, Seattle, June 2003 10. Ciorau, P., Macgillivray, D., Hanson, R.: "Recent applications of Phased Array Inspection for Turbine Components'-7-th EPRI Steam Turbine and Generator Conference-Nashville, August 2003. Ciorau, P.: " A Contribution to Detection and Sizing Linear Defects by Conventional and Phased Array Ultrasonic Techniques" 16-th WCNDT, Montreal, Aug 30-Sept.03, 2004. Poguet,J., Ciorau, P.: "Reproducibility and Reliability of NDT Phased Array Probes -16-th WCNDT, Montreal, Aug 30-Sept.03, 2004.